Latest update that we are in need of super hero now. If you can hear on everyday news, many accident,killing, robbery, rapes and etc. Know what there is a hero in India. Latest update news came last Dec. 21 in Kanpur India which hero came, but take note it is not superman or superwoman it is "super monkey". Yes it is monkey that saves the life of its mate. It was an accident when its fellow mate electrocuted while walking on the high-voltage railway on the train station. 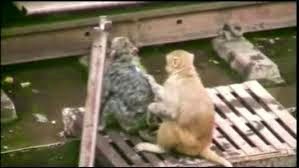 The victim unconsciously fell down on the side and as the hero monkey saw the incident, it hurriedly came to rescue. Now the hero monkey perform the first aid, but it is not as usual first aid, it is maybe the monkey way in doing first aid. Rubbing, Jumping, Patting and putting it on the water made the electrocuted monkey survive what a great monkey first aid. Many train passengers take a photos and videos on this hero monkey. And that means this latest update hero monkey came in to viral in social media.